Right off the bat let’s talk about what Cannon Brawl gets absolutely right - it’s a real time strategy game which doesn’t have the dreaded “buffer zone”: the level of play between a novice player and an intermediate player where mechanical skill trumps actual strategic knowledge. Imagine in Starcraft if you will, players who are more efficient with their resource collection and unit micromanagement will trump players who are clumsier with their actions. The victor is the better clicker, not the better thinker. Once you get past the mechanical skill ceiling, the real strategic gameplay begins and you start being able to outsmart your enemy with great plays. But Cannon Brawl is different. Admittedly it does feel more of a casual game, but it manages to get players to the level where they are making strategic decisions incredibly fast, and for that reason alone it’s worth a peek as a great entry point into the RTS genre. 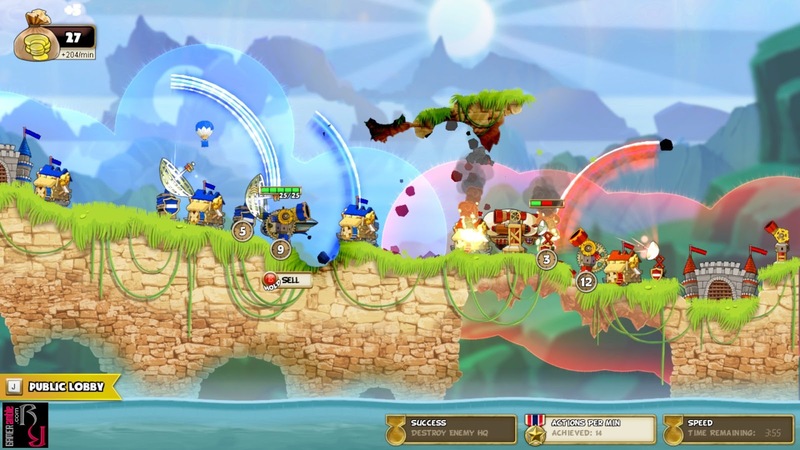 Developed by Turtle Sandbox for the PC back in 2014, Cannon Brawl is seeing new life as a competitive multiplayer game on the PS4. 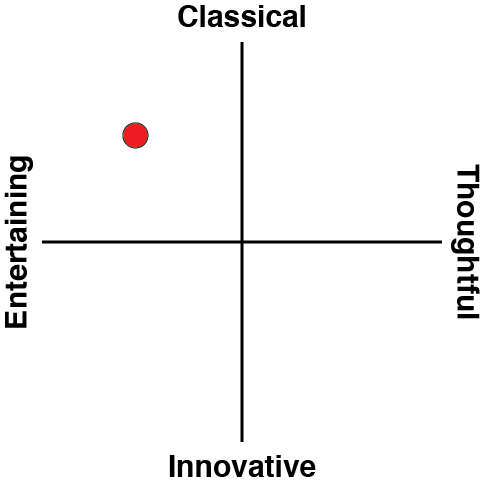 At its core, it’s a game about managing resources and fighting for territorial advantages. On the surface, it’s a game about indiscriminately blowing up all the things. 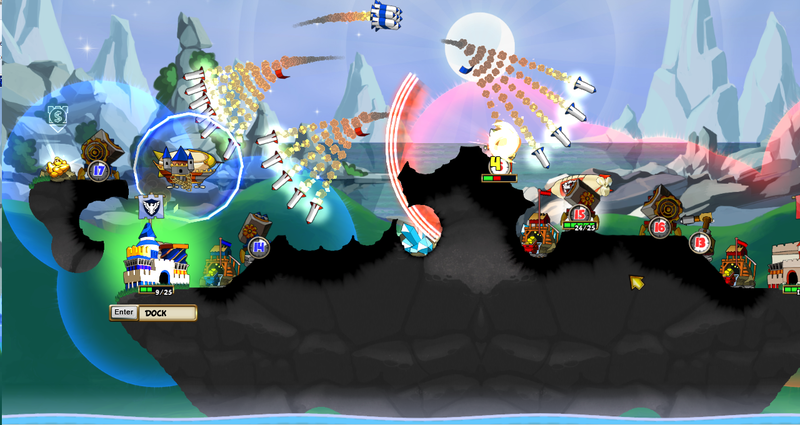 For that reason, Cannon Brawl has attracted a series of comparisons to the Worms series as an artillery themed game with a bright palette and a zany sense of humour, but deeper strategic options for players who want to invest more time. Turtle Sandbox has been great at supporting both types of play in Cannon Brawl, leading to a package that’s definitely a shot worth taking. The main gameplay takes place in a fast paced head to head match on a 2D plane. Players control an airship with which they can purchase buildings from the home base and activate them. The most basic building is a Territory Balloon, which claims space for your team so you can start building on it. The other essential building is a mine which is built on resource locations and increases your income gain. On top of these, players can choose between a huge variety of towers, each with their own strengths and weaknesses, to use against their opponents. There are the basic artillery towers and shield towers, but Turtle Sandbox manage to craft another two dozen towers, each with its own strengths and weaknesses without feeling too dominant in the overarching meta. Each player can put together a catalogue of five towers in their loadout for each match, leading to a solid variety of viable strategies. In addition to this, players can choose between a variety of airship pilots, each with their own abilities they can use in battle. In my experience, some pilots were significantly more powerful than others (I found favour with the pilot who could heal turrets at no cost) but the differences allowed for more depth in playstyle. The meta involves going into battle with a coherent strategy – knowing which towers will deal damage for you, which towers are your defensive options and having your victory planned out. Going into battle with five powerful and expensive towers that you thought looked cool will easily spell out a loss. Because good players are differentiated from mediocre ones by preplanning and game knowledge rather than mechanical skill and APM, Cannon Brawl naturally lends to a style of macro heavy play focusing on efficient movements and adapting to opponents’ strategies. There were times where I felt the matchups were stacked too heavily against me to win, but in those cases I still had enjoyable matches where I tried to figure out how I could use the towers I picked to get a surprise edge over my opponent. The main flaw in the PvP mode was that the game ended when one player’s home base was destroyed, which could happen minutes after a clear winner was decided. The last few minutes of waiting for your opponent to destroy you is fun for neither player. For all its time spent in competitive balance, Cannon Brawl thankfully features a robust online matchmaking system complete with rankings and ladder points. The game is unfortunately locked to 1v1 matches with no variations, instead relying on cramped maps to force players to try and edge each other off. It’s a fun distraction for a while, with enough variation that no two games will be the same, but it definitely doesn’t have the shelf life of a full retail RTS game. Cannon Brawl also offers a competent single player mode, which allows players to unlock a long list of towers and test them out on context sensitive levels. The AI will be programmed to use towers in certain ways and be beaten with certain strategies, allowing players to get a feel for the strengths and weaknesses of each tower. It’s a great way to prepare players for PvP and the types of matchups they are likely to encounter. Story Mode is also where Turtle Sandbox show off its unique character designs and build upon a simple plot for the game. With regards to production values, Cannon Brawl is simple and vibrant. Graphics are a brightly coloured cartoonish affair, with effective use of colour to differentiate teams, turrets and airships. The information on screen can get a bit cluttered in the late stages of the game where many shots are being fired off at once, but otherwise the cannons look distinct from each other and the power of each shot is visually and aurally reflected with vigour. 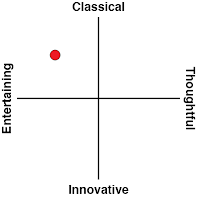 The music is serviceable but not particularly noticeable, which is fine considering that players will want to focus their concentration on strategic decisions. 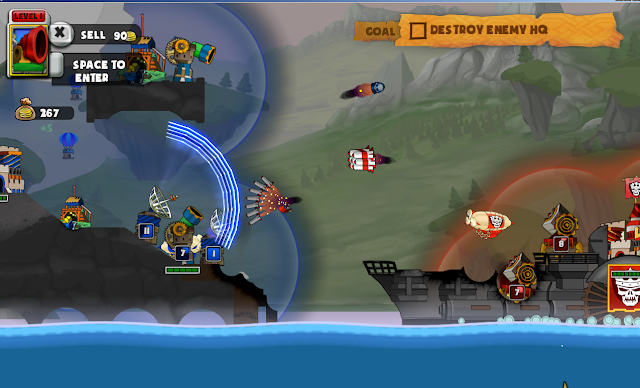 For newcomers to the RTS genre, Cannon Brawl is a great introduction which really shows off the strengths of the genre. It really doesn’t take a lot of learning for a novice player to start making strategic decisions, and to understand basic concepts crucial to the genre such as efficiency, macromanagement and aggressive/defensive styles of play. 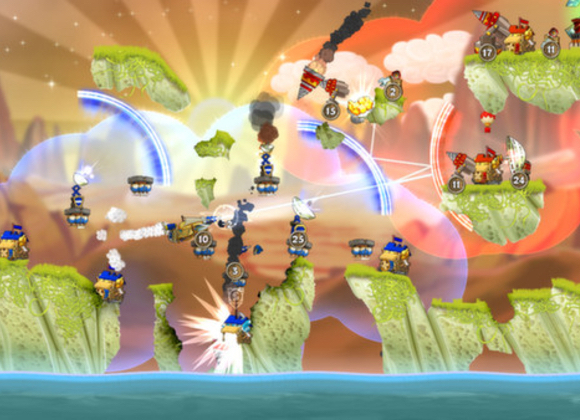 While the strategic depth isn’t as much as other titles, the simplification results in Cannon Brawl being wickedly accessible and a blast to play for all ages.